We usually have my Father-in-law over for Sunday dinner and although he's not a massive eater, he does love his puddings. I had been busy tidying the garden most of the day so hadn't gotten round to making anything for dessert and not wanting to send Greg to bed with no pudding, I managed to throw this tasty pud together from the contents of my fridge. Beat the soft cheese with 40g of the caster sugar until smooth and creamy. Put the sweetened cheese into the fridge until needed. Put the rhubarb in a pan with the remaining sugar and grated ginger. Add a splash of water and heat until the sugar has melted and the rhubarb starts to break down. Take off the heat before putting in the fridge until needed. Mix the crushed ginger nuts with the melted butter until the chipmunks are properly coated. Again, put in the fridge until needed. To serve, spoon some of the rhubarb into a bowl then top with some of the soft cheese mix, before crumbling some of the buttery biscuit crumbs over the top. 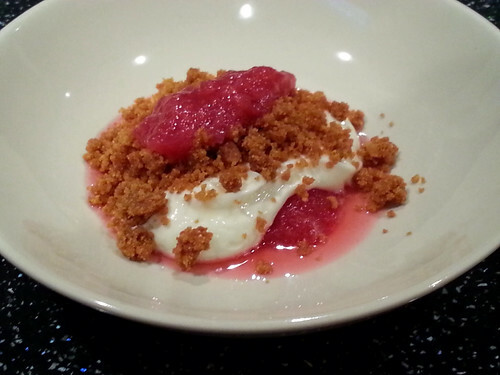 So there you have it, a quick and easy deconstructed rhubarb & ginger cheesecake. Delicious! Greg scoffed his down in no time so I think it's safe to say that I still have the Father-in-law in the pocket!